I have listed here eight instances of a coyote’s reaction to dogs and humans to show what one might expect. Except for the human encounter, and the tightly leashed dog encounter, this coyote did not quickly flee. The coyote was responding, in all the other examples, to either past incidents with a particular dog, or to the immediate situation in which it felt potentially threatened or intruded upon. Please note that encountering a coyote will almost always involve the coyote fleeing or hiding. The coyote described here is bolder than most and the leader of its pack: it is important to be aware of this type of coyote. 1) We watched a coyote keep away from, and monitor, a group of dogs and walkers that this coyote long ago had become wary of: the dogs in this group have chased the coyote, and these people now throw stones at it. There definitely is a feeling of antagonism between certain coyotes and certain dog walking groups. The result is that the coyote keeps away from them, and instead watches them, and sometimes insures for itself that they leave the park by occasionally following them at a distance. This morning, when the coyote first saw, or maybe heard, this group approaching, it hurried up to a high vantage point above the trail to watch them. Neither the dogs nor walkers seemed to be aware of the coyote. The coyote kept intently focused on them, scrutinizing every move of the group as it slowly walked by. Usually after this group passes, this coyote remains on its ledge to relax for a little while. It began to do so. However, within only a few minutes, another walker and her dog passed by below on the same path. 2) This time, after watching these go by, the coyote scurried down from its rock and followed the dog and walker at about a 60 foot distance — it followed at a casual and slow pace. I was able to observe them only until they went over the horizon — beyond the crest of the hill they were hidden from my view. They did not seem to know that the coyote was there — neither the dog nor the walker stopped or looked back while they were within my view. This dog is another one that has pursued this coyote, and it tugs on the leash attempting to go after the coyote whenever the coyote is in its sight. So, for the coyote, these were not benign passers by. I have observed that the coyote has a keen memory of past incidents and of individual dogs who frequent the park. All previous coyote interactions with particular dogs have to be taken into account when assessing what is going on with a coyote. The coyote probably wanted to make sure that this dog was headed out of the park. I’ve seen this coyote follow the above mentioned larger dog group with this purpose, and I have seen it follow this walker for a short distance. Our coyotes have always become agitated around dogs who get too close to them: the agitation is manifested through scratching the ground in anger and grunting. These are blatant warnings given by a coyote to warn off any dog. The coyote may also engage in a distressed barking session for 20 or so minutes. This barking has always been the result of a dog intruding on a coyote. Ultimately the coyote may nip at the dog to move it away and warn it off. In an urban park, dogs and coyotes are pitted together in a relatively small area. Might there be a SPACE issue here? Coyotes need to be able to roam over areas for food without feeling constant competition or threats from dogs. Dogs are all over the park — it is the unleashed and unruly ones that have been a problem, usually in the remoter parts of the park. An unruly dog may pursue, get too close, or threaten coyotes in other ways, such as through visual cues. Coyotes can read subtle cues involving eye-contact, level of energy and body language: this is how all canines communicate. Unfortunately, even leashed dogs communicate this way. What is often communicated is threats and antagonism. Lately, I have seen a coyote take more initiatives regarding dogs — possibly it is trying to take control of a situation — especially when it involved dogs which have threatened it in any of the ways I’ve listed above. For instance, I’ve seen a coyote approach an area where there were several dogs: here it normally waits at the periphery and observes, but I have seen it also put on its agitated warning display — the same as when it has been intruded upon. The coyote’s approach to this area was seemingly because the coyote didn’t like the noise or activity level of the dogs, but also there were dogs there which had approached the coyote in the past. Other initiatives a coyote has taken are keeping an eye on — monitoring — those dogs which have chased it or intruded upon it, and following particular dogs to make sure they leave the park. Please remember that even if our dogs approach a coyote with playful intentions, this is NOT how a coyote sees the approach: allowing your dog to approach a coyote in the first place sets up a situation where now the coyote knows the particular dog and will keep vigilant when it is around. On the other hand, I have seen coyotes respect those dogs which have accorded them respect. Coyotes know immediately upon seeing a dog if it is respectful. This kind of respect has to trickle down from the owner. There are dogs who are dismissive of their owners as their pack leader and for this reason they don’t obey their owners. This includes dogs who pull at their leashes. These dogs which are disrespectful towards their owners appear to be the same ones who also are disrespectful of coyotes. So, back to the lone walker with her dog which I left off above. Within minutes I heard the familiar distressed barking of this coyote — it was upset and complaining. I have never heard a coyote bark without provocation when there are walkers and dogs in the park. My guess is that this walker became aware of the coyote and threw a stone at it because it was following her — I’ve seen her do this before when a coyote followed her, or it could be that her dog lunged towards the coyote. The coyote must have fled immediately up to the top of the hill to where I was hearing it — it was no longer anywhere close to the path or to the walker. The barking subsided fairly quickly. In this case, one could say that the coyote actually caused the incident by following the dog. But it should be remembered that the coyote was most likely reacting to the previous behavior of this particular dog. Could it also have been reacting to more generalized stresses caused by a constant stream of dogs in the park, many of which are unruly and any of which could be a potential threat? 3) Shortly thereafter, I saw this same coyote on a rock further along the same path that all of the above mentioned walkers and their dogs always take. This coyote seems to know the habitual routes of most of the regular walkers in this park and chooses lookout points from which it can confirm that certain of them have left the area. There are actually only a couple of groups monitored in this way. When I saw the coyote on its rock, the dogs had already gone by. The coyote was peacefully observing its world when two British fellows and their dogs came by — dogs that have not had an incident with the coyote because they have been kept away from coyotes and leashed. The coyote, high above the path on its rock, stood up at alert to assess what was happening with them, and then it casually took off. This last is by far the most common response to dogs and people by this coyote. In the next few days I watched several people deal very differently with this same coyote. I wanted to list these for everyone’s enlightenment. 4) A woman with her Ridgeback was coming up the same path that a coyote was taking in the opposite direction. Each saw the other approaching. The woman decided to move forward with her dog tightly leashed right next to her side. When she got within about 60 feet of the coyote, the coyote decided to turn back and eventually it moved into the area beside the path. Both parties then went on their merry way. There had never been a previous antagonistic encounter between these two. This woman did it exactly right: by keeping her dog tightly leashed and right next to herself, the dog was not free to follow its own desires or instincts, nor did it have much chance of communicating visually with the coyote. The woman controlled the situation. 5) Afterwards, a woman with no dog came walking towards this same coyote which had moved further on, but was still on this path. They got to within 30 feet from each other — the configuration of the winding path did not allow much distant visibility. The coyote, again, veered off the path. The woman kept walking and never saw the coyote.This type of encounter I have seen a number of times. 6) Another encounter involved a man with an unleashed dog, a regular walker in the park. Last year he used to allowed his dog to “play” with this coyote: “Ahh, they know each other”, he told me when I asked him to please leash-up. So this coyote and dog had interacted in the past, but the interaction was probably less about “playing”, in the eyes of the coyote, and more about the “chase-chase” and “oneupmanship” behavior I have spoken about before. 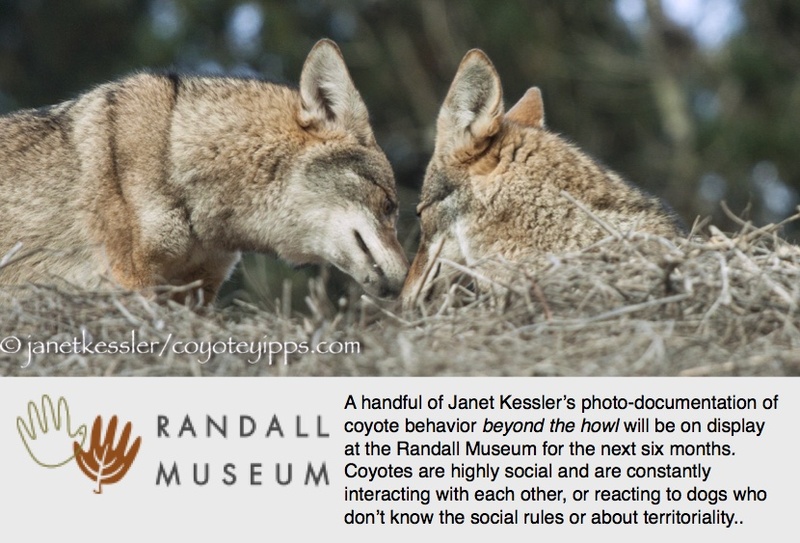 We all know that “interaction” of any sort with a coyote breeds familiarity and breaks down the “wild” barrier that we all have been counting on for our coyotes. So this man was walking his unleashed dog when the coyote appeared from behind a bush. It was early in the morning. The dog went after the coyote. With intense yelling the owner was able to retrieve his dog and then take off with his now leashed dog. The coyote did not follow them, but stayed in the same location. I wondered if the coyote could have been purposefully waiting for this man to re-appear? This coyote keeps its eyes on certain dogs in the park which it has become wary of due to their antagonistic encounters with it. And the coyote knows the habitual routes of those who frequent the park — the walks in the area tend to be loops — it might have known the man and his dog would re-appear. When I saw this man re-approaching again, the coyote began scratching the ground and grunting — a clear sign of its agitation at seeing the dog and walker again. This time the dog was leashed firmly at its owner’s side. The coyote ran off up to a little knoll to get away from them as the man passed by. The coyote remained here and watched, but it did not “flee”, nor did it follow. What did it mean that this coyote remained without leaving? There were no other walkers at this time. 7) On this same day, I joined two friends for part of their walk. They each had large Labradors, one of which occasionally had pursued the coyote. We walked around and then came upon this same coyote who had remained, unusually, in pretty much the same spot where I had last seen it. I decided to stay to see what might happen with this coyote, so my friends walked on up a hill, intermittently stopping to look at the coyote. The coyote stood in a wide open area, with its ears lying flat back for much of the time — it was agitated and grunted a little when the two Labs stopped on the path with their eyes on it. The dogs and walkers eventually walked on, and the the coyote’s behavior subsided. The coyote did not follow them. Although these Labs had not approached the coyote, they had been fairly close — I would say right at the border of the coyote’s “critical distance,” and they had been looking at the coyote intently. Intensity of gaze is seen as a threat by many animals. After these dogs left, the coyote meandered to a more secluded spot through a grassy area looking for gophers before climbing a hill where it could rest in peace. That was the end of the activities while I was there. 8- Today I saw this coyote react agitatedly towards a dog which has seldom upset it. This dog and its owner came down their habitual everyday path. The coyote has watched them often enough to know that this dog keeps away from it: the dog has never chased the coyote. Today the coyote was hunting in an open area when it became aware of the walker; it stopped its activity and watched. However, the coyote did not like it when the dog veered off the path in the coyote’s direction — the dog must have come too close to the coyote; also the dog may have been facing the coyote. Rather than move away, the coyote began a defensive display, and then ducked into some tall grass where it went into a distressful barking session. The dog and walker just kept walking on, but the barking didn’t subside for many moments. I’m wondering if the sheer number of dogs and their movement in the park could be an underlying stressor to the coyote’s agitation and reaction to dogs?